Going into the final V.E.S. match, Heardy was leading with 10 points followed by Rob on 11 and then Fieldy and me on 12 and it was all to play for. To secure second place in the league I needed to beat Rob and Fieldy and with fourteen anglers fishing today there was an outside chance I could overhaul Heardy’s two point league if he drew badly and I did well in my section but of course it could go the other way too! Looking at the section boards the only peg nobody really wanted was 114 at Redbridge and everybody was hoping for a draw at Hambridge. The forecast was awful for today but varying reports were saying the bad weather could hit us anytime from dinner time to late afternoon, for now there were blue skies and it was a gorgeous day although we’d had a frost overnight. Rob announced the draw and I hung back thinking that if I waited until last there had to be a good chance peg 114 would attach itself to some other unlucky angler. When I heard Baz Morgan say he had got it (well he had to draw a bad peg sometime! 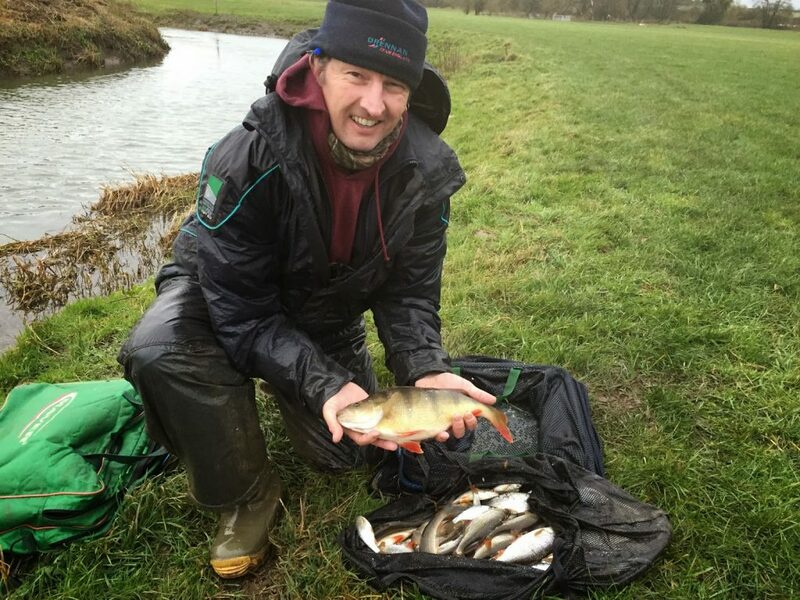 ), I felt it was safe to dip my hand in the hat, there was only one peg left and when I opened my fingers I saw H5 at Hambridge staring back at me – result!, Fieldy had won off it last week although it was up and coloured and the fish seemed to have spread out compared to the week before. Justin had drawn H4 on the bend and Paul Homewood was on the swim above the bridge where he’d done nearly 21lb two weeks ago, Frank was above me and Hurf was up on the bend where I had those chub and we arranged the usual side bet. Rob was below the bridge where Baz had caught 29lb and 13lb in the last two matches and Ashley Tomkins was below him. In the other section Fieldy had drawn 109 which is a great peg but Justin blanked the last time it was in and Heardy was in 125 which has been hit and miss, Bruce was in 126 and should do well. We arrived at the river and dropped our kit over the fence before driving up to the car park and putting our waterproofs on. My peg looked great and I could get my box close to the water with out it sinking in too much. I set up two rigs, a 1.5 gram Drennan Carbo with 0.12mm bottom and size 18 B611 and a lighter 1 gram version with 0.10mm bottom and size 18 B511. Plumbing up I found the deepest part of the peg was down the middle at about 6 metres and it shallowed up if you went any further across. Scott Jackson and Dave Sydenham turned up for a look round and were with me with the all in was called, they said they’d watch me catch a fish and then leave me to it. I feed some caster and maggot upstream and some hemp nearly in front of me and started with double red maggot on the hook, holding the rig back and inching it through. I had a few indications and then caught a minnow which wasn’t an ideal start but at least I hadn’t blanked. I then had a nice chublet around 5-6oz and I was up and running, Scott and Dave went on and I had another four or five chublets and it was a steady start. At this early stage Hurf hadn’t caught and Frank had caught a small roach and a couple of minnows. I then had a 3oz roach and hoped I was going to be in for a busy day, I tried caster but it was slow going so switched back to maggot and bumped a couple of better fish which wasn’t in the plan. Frank netted a chub around a pound but Hurf was still fishless. Then we had the first few spots of rain and the wind started to get up and both were freezing cold! I was still getting odd fish and finished the first hour with 19 fish and thought I must have 2lb or so and hoped some of those better roach and perch would put in an appearance sooner rather than later. The rain and wind was hitting me straight in the chops and although my Polar Buff was keeping my neck warm it’s times like this that wearing glasses is a right pain in the bum. The wind was playing havoc with presentation and blowing the pole all over the place, Hurf still hadn’t had a bite and came for a wander and he said he didn’t think he’d be here much longer as he’d been feeling rough and he was really cold, Frank was also looking a bit moist and contemplating an early bath. He went down to see how Justin was getting on and just as he left I hooked what felt like a better fish and it turned out to be a 12oz roach – lovely! or it would have been if the hook hadn’t pulled out at the net! Steve came back and reported that Justin was bagging up on the stick and the pole with big roach and chub on caster although a pike was giving him problems and he’d already lost some good fish to it, he also said Paul was catching small roach one a bung on the whip. He went back to give it another go but said he’d probably be packing up soon. I kept trying caster but was having to wait too long for bites, I did hook what felt like a better fish only for a pike to grab it and I spent five minutes playing it before it came off but thankfully I hadn’t lost my hook. I was now frozen and had put my gloves on and every other item of clothing I had with me and it was all soaked, this wasn’t much fun. After Mr Pike showed his teeth the swim went quiet and I could only get the odd 1-2oz roach, both Hurf and Frank packed up and were headed off to the warm and dry with half the match gone. After they’d gone I started catching really well and had a succession of roach including the odd netter although I was bumping the odd fish too. I’ve then struck into a bite and was met with solid resistance as a fair bit of blue hydro streamed out of the pole tip, the way it was fighting I just knew it was a perch and a beautiful stripy around 2lb slipped over the rim of the landing net, this was more like it! More roach followed and then I’ve struck into a fish and something gave way, I thought the rig had snapped but no, my elastic had!, to be fair it had been in there a while, I got off my box and managed to hook the line with the pole tip and ship back very gently, I got the rig back and the 8oz roach that was attached to it. I then had to faff about sorting another top kit out and it took a while before I was fishing again. All the commotion hadn’t helped things and bites slowed right up, with an hour and a half left I thought I had 8-10lb but I needed my catch rate to improve. By now I’d put my glasses away as I couldn’t see through them anymore, I’d also given up trying to keep my hood up and was soaked through. I also managed to hook the back of my hood in a place I just couldn’t reach and ended up having to take my coat off in the driving rain to remove it and I ended up even wetter (if that was possible!). I had hoped that when the light started fading the bigger roach might switch on but it didn’t really happen, I did have a pike take another decent fish but only added a few more roach and also had two ruffe (the first I’ve caught in years) and some tiny gudgeon. I finished with 76 fish which I hoped would be around 10-12lb but I wasn’t sure that would be anywhere near good enough today. I packed up and went back to the car to collect the scales and as I walked back to weigh Paul in, the rain pretty much stopped and the wind died down – typical. 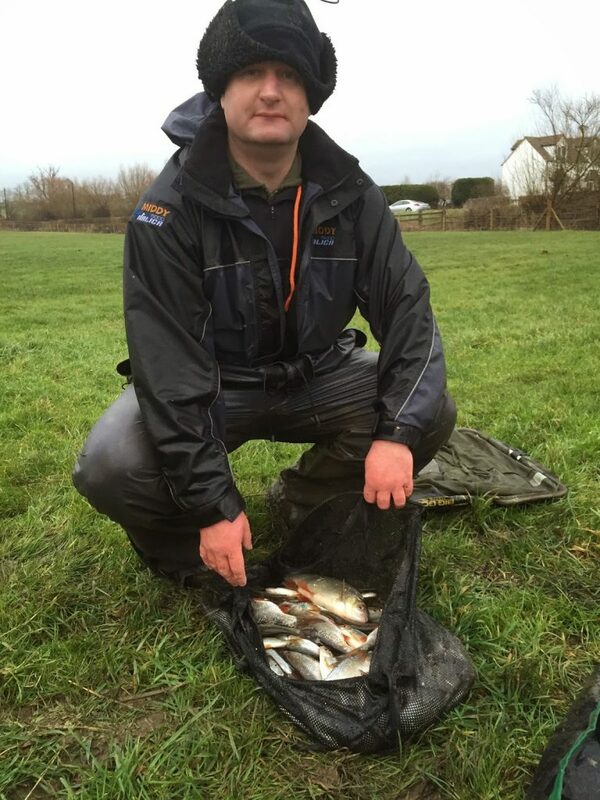 Paul had done even better than the last time he had the peg when he had a load of roach and a couple of decent perch for 24lb 1oz, a lovely net of fish. Justin pulled his net out and it looked like it was going to be close, he didn’t have as many fish but he had some real quality including several chub, some nice perch and some clonking roach. After two weighs his total was 25lb 5oz to go into the lead and he was on a golden peg too. My fish went 11lb 7oz which I was a little disappointed with, out of interest I weighed the perch which went 2lb exactly, a lovely fish. As we finished packing up Rob and Ashley arrived at the bridge, I asked how they’d got on and Rob had a cracking day catching 18lb 12oz of mainly roach and Ash had 12lb 7oz which meant I’d finished fifth in my seven peg section with double figures! Realistically I knew any chance of a league placing had gone unless Fieldy had blown right out as well. Back at the results and Fieldy hadn’t blown out, in fact he’d won the other section with an excellent 14lb 14oz of roach and chub so that was that for me then. 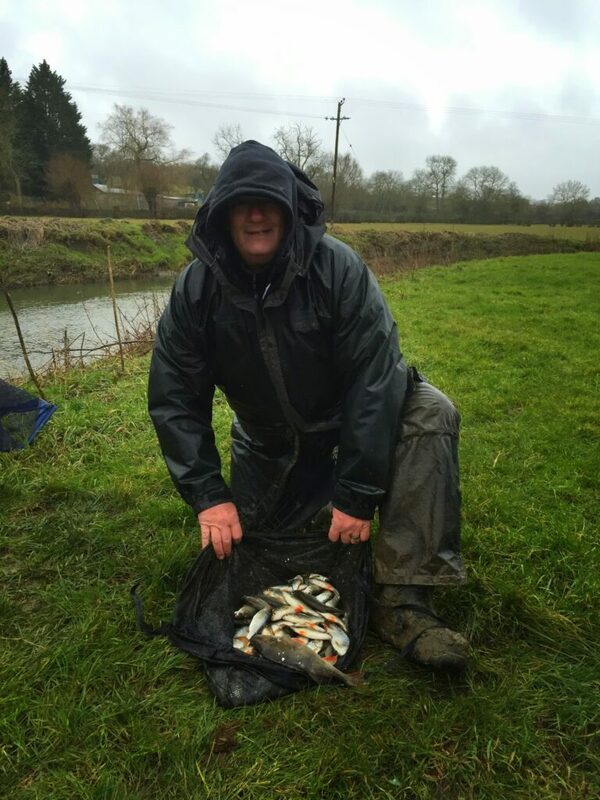 Baz had caught a ‘heroic’ (his words) three chub for 8lb 15oz from peg 114 and Neil Dring had 8lb 13oz from peg 123 and with Bruce weighing 6lb 1oz from 126, Heardy’s 2lb 2oz from 125 gave him five points on the day. After totting up the points, Fieldy had snatched victory in the league with 13 points, Rob also overtook Martin to finish in second place with 14 points and Heardy had to settle for third with 15. As for me, I ended up in fourth (and no cigar) with 16 points and needed to beat Ash today to tie with Martin on points and pip him on weight, oh well, there’s always next year! So Hambridge had fished really well again but when it’s clear it does seem to be that the further away from the bridge you go, the lower the weights are. When there’s some colour on it those fish do seem to spread out a bit more. The club would like to say a massive thanks to V.E.S. Precision for their continued support and sponsorship, it really is appreciated and thanks again to Steve and Cindy at the Royal Oak, Ilminster for putting up with us and also to Robin Cox for organising another great league.